Launched atop the most-powerful version of the ULA Atlas 5 rocket on Aug. 5, 2011 from Cape Canaveral, Juno was sent on a circuitous route to reach the king of planets on July 4, 2016. That 1.8-billion-mile trek includes flying a mere 310 miles above Earth on Oct. 9, 2013, at the completion of its first elliptical orbit around the sun, to use our home planet's gravity to boost Juno by 16,330 mph and fling the spacecraft out to Jupiter. The first "deep space maneuver" occurred last Thursday, Aug. 30, more than 300 million miles from home, to begin fine-tuning the craft's course to intercept Earth. 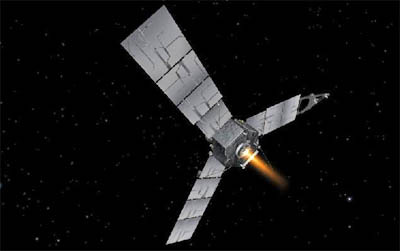 The Leros-1b main engine was fired for 29 minutes and 39 seconds, changing Juno's velocity by about 770 mph while consuming around 829 pounds of fuel. It was an accurate maneuver and navigators reported it was a success. But subsequent reviews of telemetry revealed one of the propellant pressures within the spacecraft's propulsion system was higher than expected. Juno's controllers opted to scrub Tuesday's burn and take an extra 10 days to examine the pressure increase and consider mitigation options, NASA said in a statement. The upcoming burn, targeting a similar duration and speed change as the first, is rescheduled for Sept. 14 with no impact to the mission. "We still have the Earth flyby and another 1.4 billion miles and four years to go to get to Jupiter," said Scott Bolton, Juno's principal investigator. "The team will be busy during that whole time, collecting science on the way out to Jupiter and getting ready for our prime mission at Jupiter, which is focused on learning the history of how our solar system was formed. We need to go to Jupiter to learn our history because Jupiter is the largest of the planets, and it formed by grabbing most of the material left over from the sun's formation. Earth and the other planets are really made from the leftovers of the leftovers, so if we want to learn about the history of the elements that made Earth and life, we need to first understand what happened when Jupiter formed." Jupiter's gravitational pull will draw Juno inward as the craft approaches, eventually reaching a speed of about 160,000 miles per hour -- making it the fastest human-made object ever -- before putting on the brakes to enter orbit. The spacecraft gets to Jupiter on July 4, 2016, firing its main engine for 30 minutes to enter a 107-day capture orbit around the planet. Further maneuvers will narrow that orbit down to 11-day durations for the science mapping expedition that loops from pole-to-pole 33 times. "Jupiter orbit insertion is almost like reverse thrust in a jet when it's landing. We're going very close to Jupiter. In fact, we're moving faster than any human-made object has ever moved at the time we do this. You basically turn the spacecraft so the engines are facing forward, you fire them and they slow you down, just like the reverse thrust of a jet, except it's a rocket engine," said Bolton. "That slows us down enough so Jupiter's gravity field now grabs us and we're trapped in orbit around Jupiter." Juno's $1.1 billion mission will probe Jupiter's origins, interior structure, atmospheric dynamics and polar magnetosphere.